Omega-3 fatty acids are a type of polyunsaturated fat and are derived from either fish or plant sources. “Antioxidant” refers to the chemical property of substances that are able to neutralize free radical damage in the body. While omega-3s do not rank among the super antioxidants, a study in the August 2002 "Journal of the American College of Nutrition” reports that they do lower free radical levels. Omega-3s may also increase activity of antioxidant enzymes manufactured by the body. When your body breaks down foods or is exposed to environmental toxins, it produces unstable compounds called free radicals. Free radicals cause damage known as oxidative stress, which may contribute to the development of cancer, rheumatoid arthritis, and Alzheimer’s, eye, heart and Parkinson’s diseases. Antioxidants are believed to protect your body against oxidative stress by neutralizing free radicals. Thousands of different substances in foods can act as antioxidants. Substances with high antioxidant activity include anthocyanins, beta-carotene, catechins, coenzyme Q10, flavonoids, lipoic acid, lutein, lycopene, selenium and vitamins A, C and E. Your body also makes antioxidant enzymes. In observational studies diets high in antioxidant-rich foods such as fruits and vegetables have been associated with lower risk for many chronic diseases. According to the Cleveland Clinic, berries -- such as blueberries, blackberries, raspberries, strawberries and cranberries -- are high in antioxidants, along with apples, avocados, cherries, pears, plums, pineapple, prunes and kiwi. Some of the richest vegetables sources include artichokes, broccoli, red cabbage and white and sweet potatoes. Small red, black, kidney and pinto beans are also high in antioxidants. Many herbs, including cinnamon, cloves, ginger and oregano, are also antioxidant rich. Other good sources include nuts, such as walnuts, pistachios, pecans, hazelnuts and almonds, green tea, coffee, red wine, pomegranate juice, oats and dark chocolate. 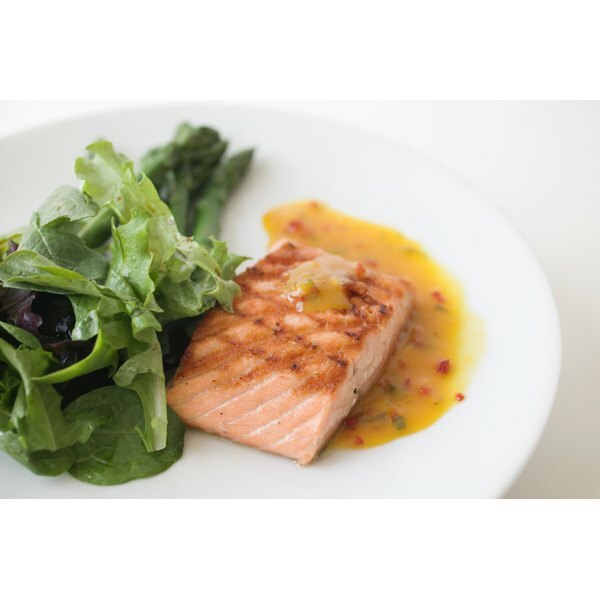 The omega-3 fatty acids include DHA and EPA, found in fish, and ALA, found in plant foods. Omega-3s have many heart benefits -- they protect against arrhythmias, heart attack and stroke. They also slow plaque build-up, reduce triglycerides, blood pressure, inflammation and clotting, and improve lipid ratios. Due to their anti-inflammatory effects, omega-3s may be beneficial in treating rheumatoid arthritis, asthma and Crohn’s disease, according to Pharmacist’s Letter. The potential role of omega-3s in preventing and treating cataracts, osteoporosis, renal disease, depression, bipolar disorder, Alzheimer’s disease and other conditions is still being studied. Antioxidant activity is a potential mechanism through which omega-3 fatty acids may reduce inflammation. In rats, omega-3s increased production of the antioxidant enzymes glutathione peroxidase, superoxide dismutase and catalase. In people with Type 2 diabetes, omega-3s increased glutathione peroxidase but not other antioxidant enzymes, according to a 2002 study published in "Diabetes Metabolism." Fish that are rich in omega-3 fatty acids include salmon, mackerel, lake trout, sardines and tuna. Plant sources of omega-3s include ground flaxseed, English or black walnuts, pumpkin seeds and flaxseed, walnut, canola, soybean and olive oils. Some omega-3 sources are also rich in other antioxidants. For example, flaxseed and walnuts are high in vitamin E, while salmon and tuna are high in selenium.